This is it! The top four teams from semis battle for the title of Vancouver Island’s High School Slam Champion! 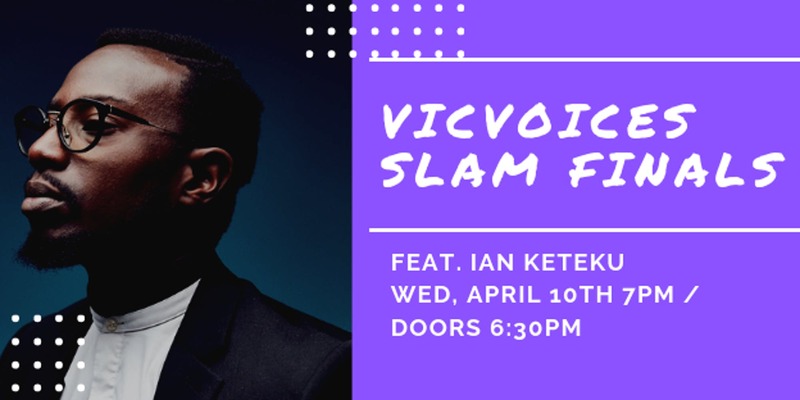 Plus feature performances from our Poets of Honour and the singular, talneted Ian Keteku. Tickets: On Eventbrite and at the door, $10 for adults / $5 for students / free for registered poets and coaches. Unfortunately, the VEC’s elevator is broken and cannot be repaired, so at this time the only way into the VEC is through a main entrance and up a flight of stairs (details below). We recognize that this is a major barrier for those with mobility devices and folks who have trouble with stairs. We want to be creative in navigating this barrier, so if you’re one of these people, and you have ideas about how we could support you in accessing the space (for example, by having a staff person or event organizer meet you at the door and carrying your mobility device up the stairs and/or helping you up the stairs), please get in touch. TERRITORY ACKNOWLEDGEMENT: We recognize that our work occurs primarily on the unceded territory of the Lekwungen peoples, today known as the Esquimalt First Nation and Songhees Nation, as well as on other unceded territories on southern Vancouver Island.